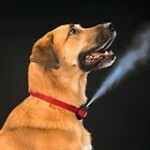 Home » Dog Product Reviews » To Prong or Not To Prong – Is A Prong Collar What You Need? To Prong or Not To Prong – Is A Prong Collar What You Need? It is often seen as a cruel piece of equipment seen on dogs, but you can’t help but wonder if it is something that you and your dog should use. A metal, wide collar made up of links that include 2 prongs each that find their way through your dog’s fur and to his skin. 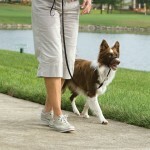 It looks as though it could be quite painful, yet effective to end leash pulling. Is this something you could benefit from? The big question and debated hot topic when it comes to prong collars is whether or not they are painful to the dog. The short answer is that yes, they are painful. This is how they work. However, you can make something painful or uncomfortable without totally damaging your dog’s sensitive throat and this is what some dog trainers and owners use the prong for. 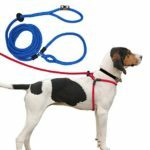 Instead of relying on this piece for ending pulling on a leash, they use it as a communication tool for various training purposes. Prongs can be harsh for very sensitive dogs and should never be used on small breeds or puppies. Used incorrectly, a prong collar can cause significant injury to your dog’s throat even if you cannot see it. Avoid this by not using it for leash pulling and not allowing the prong to sit in the incorrect place on his neck. The collar should sit just behind the dog’s skull, above all the delicate tissues on his throat. The prong should never be yanked, jerked, or pulled with great pressure no matter where it sits on your dog’s neck. What Can I Use a Prong For? Prong collars should only be used under the guidance of a professional dog trainer that understands and accepts the dangers and the benefits of using a prong correctly. If you are not a seasoned, educated trainer then consider using a no-pull harness to stop leash pulling. 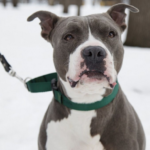 If you want to advance your dog’s education as well as your own, and your dog is capable of handling a prong collar you may find a great deal of benefit consulting a professional trainer for help and guidance. Prong collars can be used for helping to bring more self control when your dog seems to be unable to control his own actions. Combined with positive reinforcement, this type of aversive training can actually help your dog balance out his behavior. However, it should not be used as a punitive tool or as a correction. Instead, use it as a way to give your dog a choice; he can make the right one and get rewarded with a treat or make the wrong one which puts more pressure on the prong. When in doubt, just use a harness!